On July 25, 2016, Glen was driving northbound on White Plains Road in Bronx, NY. As he was crossing the intersection of E 235th Street with the right-of-way, another vehicle failed to see Glen and proceeded into the same intersection driving eastbound. As a result, both vehicles collided (T-bone accident). Glen hit his head on the steering wheel and the airbags deployed, causing him to also hit his head on the head rest. He was taken by ambulance to Jacobi Hospital for diagnostic testing and was later discharged with pain medication. As a result of the accident, Glen sustained injuries to his neck, back, left knee and chest. He described the worst area of pain in his back and chest. Bending forward or backward became difficult for Glen. He also suffered with buckling and locking of the left knee. He participated in chiropractic treatment for about 6-8 weeks and over nine months of physical therapy (electronic stimulation, hot/cold therapy, and myofascial release) to treat his injuries. Glen was a loyal listener of Adam Handler’s radio show on Irie Jam 93.5 FM. After his accident, he remembered just who to call! With the help of our team, we dealt with the uncooperative insurance company – Progressive. 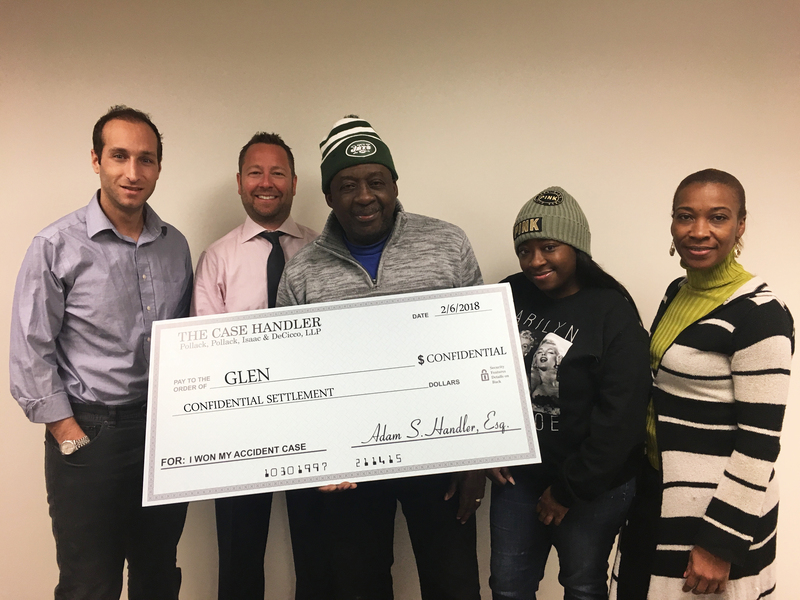 We rejected Progressive’s lowball offer to Glen, demanded more compensation, and successfully won a larger settlement amount for Glen! For a free consultation with Adam Handler – The Case Handler, contact his office atPollack, Pollack, Isaac & DeCicco, LLP by dialing 929-223-4195.